The Lower Altamaha Historical Society was established in 1979 by a group of McIntosh County citizens interested in preserving and promoting the history and culture of the Altamaha River basin of coastal Georgia. Two of the early motivating forces behind the creation and growth of LAHS were William G. (Bill) Haynes of Ashantilly and Will Dean of Pine Harbor. Others who worked to promote the early efforts of the Society were citizens who, like Haynes and Dean, had been involved in the research and preservation of local history for many years, including Miss Bessie Lewis, Bill and Honey Fanning, Doris Rabb, Mattie Gladstone and Lillian Schaitberger. LAHS has undertaken a number of worthy projects in its 25 years of existence. Among the most prominent are the cataloging and documentation of all the cemetery sites in McIntosh County, some 80 in all. This effort, which began in 1990, culminated in the publication of a comprehensive volume of county cemetery records in 2000, edited by Mrs. Gladstone who had spearheaded the cemetery project from its inception. One of the primary missions of the Lower Altamaha Historical Society from its inception was, and continues to be, the support of the Fort King George State Historic Site near Darien, scene of the earliest English fortification in Georgia, actually predating the 1733 founding of the colony by 12 years. In this regard, LAHS assumed the lead role in fund-raising efforts to assist the Georgia Department of Natural Resources in the construction of an exact replica of the 1721 blockhouse from the original specifications. This project was successfully completed in 1989, followed by subsequent LAHS support in the development of other reconstructed facilities at the Fort. LAHS played an integral role in the 250th anniversary observance of the founding of Darien in 1986 and has for several years, coordinated the observance of Georgia Founders Day activities locally in February of each year. Out of the rolls of the Lower Altamaha Historical Society over the years has come a long line of historians and promoters of the McIntosh County cultural legacy. Among these are the late Bill Haynes, author, preservationist, historian and proprietor of the nationally-famous Ashantilly Press; Bessie Mary Lewis, long-time county historian, educator, journalist and researcher of many of the records and papers that led to the eventual establishment of the Fort King George Historic Site; and Buddy Sullivan, current county historian, and author of over a dozen books on local, coastal and Georgia history, including the definitive local history Early Days on the Georgia Tidewater, now in its sixth printing. LAHS, utilizing grant funds provided by the City of Darien, has expedited the preparation and installation of several state historic markers in the community, with support provided by the Georgia Historical Society, of which LAHS has been an affiliate chapter since 1996. These markers commemorate such aspects of local history as the 1895 railroad depot at Columbus Square, the Darien waterfront, the burning of Darien by Union forces in 1863 and Sapelo Island. 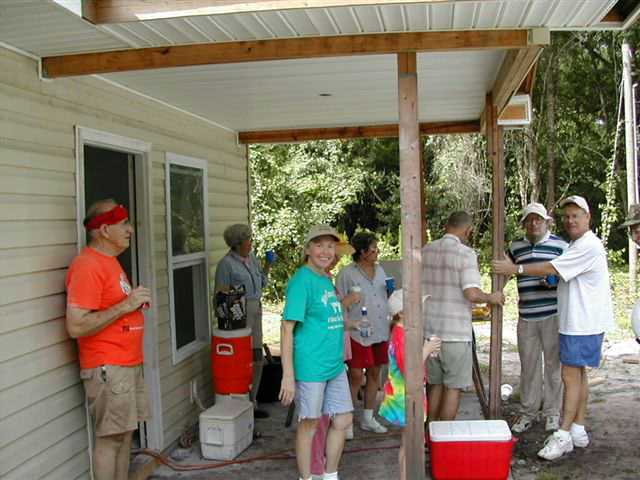 Another successful outreach of LAHS is its publication program, begun in 1998 with the Society’s publishing of an account of the 1898 hurricane and tidal wave which struck McIntosh County. Other publications sponsored by the Society are a history of the Darien waterfront, the book of county cemetery records and a reprint of They Called Their Town Darien, first issued in 1975 by the late Bessie Lewis. Past Presidents of LAHS—Bill Haynes (1980-1984); Will Dean (1984-1986); Rundle Cook (1986-1988); Marion Ricker (1988-1990); Carolyn Hodges (1990-1992); Mattie Gladstone (1992-1994); Lloyd Flanders (1994-1996); Buddy Sullivan (1996-2000); Ed Meyer (2000-2003); Dinah Jackson (2003-2004); Peyton Lingle (2004-06), Harriet Roberson (2006-10), Lloyd Flanders (2010-11), Jack Godfrey (2011-14), Buddy Sullivan (2014-16). Bill Haynes, Will Dean, Bessie Lewis, Mattie Gladstone, Annie Gill, Marion Ricker, Lillian Schaitberger, Honey Fanning, Bill Fanning and Doris Rabb. > Documentation of all the cemetery sites in McIntosh County, some 80 in all. Cemeteries of McIntosh County, Georgia is available on our Book page. > LAHS assumed the lead role in fund-raising efforts to assist the Georgia Department of Natural Resources in the construction of an exact replica of the 1721 blockhouse from the original specifications. > Integral role in the 250th anniversary observance of the founding of Darien in 1986 and has for several years, coordinated the observance of Georgia Founders Day activities locally in February of each year. The Buddy Sullivan Scholarship Award, $1000, is given yearly to a McIntosh County student by Lower Altamaha Historical Society. Book sales is an important financial income for LAHS and a convenience for members. A detailed historical account of McIntosh County can be found in the book offering. 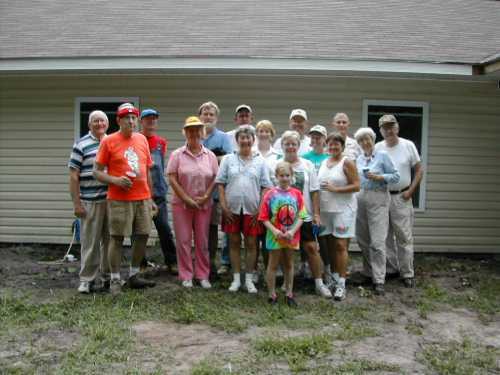 The Lower Altamaha Historical Society has been the interior paint crew for the first three Habitat for Humanity houses to be built in McIntosh County.